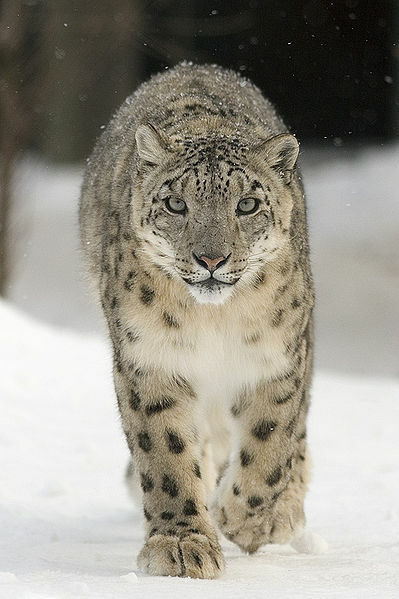 Pakistan is among few lucky countries where snow leopards can be found high up in the snow bound areas of its northern region, specially in Khunjrab (bordering China). They are found at altitudes varying between 3,000 and 5,500 metres . This beautiful animal, now on the verge of extinction, has thick hair, wide fur-covered feet that act as natural snowshoes. These leopards have powerful legs which aid them in jumping as far as 50 feet. They use their long tails for balance and as blankets to cover sensitive body parts against the severe mountain chill. Their favourite meal is devouring the poor Blue Sheep and mountain ibex. The snow leopard does not roar like other big cats of Africa and India. Rather it has a sort of a chuffing /sneezing sound that it emits to attract attention during its mating. The snow leopard has a cryptic nature of hiding from people, or even its prey, until the final rush when it can catch something. There are generally no reported cases of snow leopards being man-eaters. In fact, they are so non-aggressive and so timid in a number of cases where a snow leopard got into a corral with the livestock, the herdsmen simply got in with a club and beat it to death.